1. Developer Bootstrapping: Today, developers spend >30% of their time managing workspaces. Organizations with high attrition, rotating contractors, and restricted systems face additional hurdles. We replace wikis and manual methods with a single URL that allows any authorized user to get instant edit/build/debug access to a software project without installing anything. 2. Agile Development: Today, developers only receive feedback after their code is merged, creating badly timed feedback loops that waste cycles and violate the original premise of the agile development philosophy. 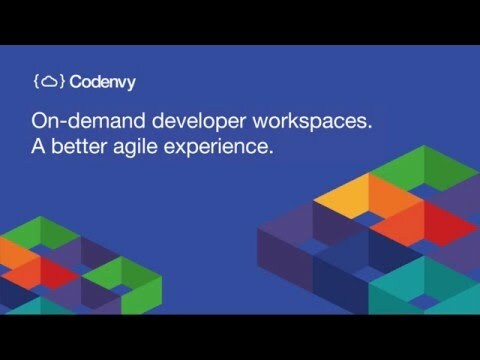 Codenvy workspaces enable real time feedback, driven by the developer that shorten development cycles. 3. Workspace Management: Today, decentralized workspaces lack security controls, code chain of custody tracking, and thrash local computers. Using Codenvy, valuable source code is never downloaded to user devices, all access is tracked and execution of workspaces happens in an elastic cluster that doesn't thrash or block under load. I was very surprised to experience a browser based developer environment with Codenvy. This was perfectly the same idea that I had in my mind several months ago : a browser based developer environment. I was really wondering how my idea has already got into work. I found about this IDE when I was looking for some means to deploy a server in Cloud Foundry. I found it more interesting as it is a cloud based IDE that support rest services. The runner allows the web app to run directly from Codenvy. I am researcher on Docker and Kubernetes stuff. I love the feature of Codenvy to use Tomact servers, Apache servers using Dockerfiles. I used Cloud Foundry runner with Codenvy and it is very interesting. Using Codenvy is very with its plugin for Eclipse. But I love to work in Codenvy workspace. It gives me all the comfort that I expect from an IDE environment. Moreover, the dashboard is well organized, uncluttered and very elegant looking. I like the way how project starts giving details on preparing workspaces, setting up configurations and runners and so on. Coding is easy with Codenvy. It has more comfort than a normal Eclipse or IntelliJ IDEA provides. Create new project window is well organized to select different options for projects. It also provides sample HELLO WORLD projects for various project options so that even a novice developer can start coding with Codenvy. The Dockerfile shown in the configs tab enables us to learn Docker as well. I love all these features. I suppose that Codenvy supports any browser and it can be used with different cloud environments. I used Codenvy to create Maven projects, servlets using Google App Engine Java, Go projects and many more. I feel very comfortable with Codenvy. Codenvy debug features are very useful, even to debug other's code. And its integration with git is very interesting. I can easily pull and push my code. I gain a perfect user experience from the well organized user interfaces, auto complete coding features, error suggestions features and so on. No wonder I can run my code from any machine from the place where I stopped coding. I feel that my code is portable. Codenvy, you are really wonderfu! I hope that it will enhance more features in the future for cloud developers. I prefer if it can use some more shortcut features like 'find and replace' etc. I love using Codenvy as it is a SaaS that provides perfect user experience and it meets all the developer expectations. I am a heavy user of the Cloud 9 IDE and a big fan of the complete cloud based coding environment. So, I was very excited to give Codenvy a whirl. I must say that I was not disappointed. I'm always wary of products that claim to be developer tools that do not do a good job catering to the developer community. Right off the bat, Codenvy does a great job at that. Their free offering is at par with Cloud 9. They do not give clear specifics on upgrading their services, which I find a bit off putting. The starting 512mb of ram that they give is not adequate for much beyond a bit of prototyping. To really work on a full scale app requires allocation of more resources. I'd rather not have to speak to someone in sales just to upgrade my workspace to a high tier. One thing that I am excited about is how they offer a paid version offsite. Cloud 9 is also based on an OpenSource project and so you can easily run the C9 engine on your own servers, but you lose a lot of the features that they have coded into their product offering....the fact that I can run an Open Source version as well as pay to run the full version in my own environment is a nice feature. Pricing out of the way, lets get down to the fun stuff! The ide is well thought out. i enjoy the Che engine. It certainly has a good feel to it. It's a bit light on features at the moment, but that is not a bad things. It has what it needs and it can obviously grow as needed. The Docker environment is something that I love! Here, Codenvy shows that it has a good handle on the environment. I was able to run php applications with ease. Bottom line, I do not feel that this is a mature a platform as C9...but that is a fault that is easily cured with time. But they do have a great product, and certainly with the ability to code and use eclipse plugins, makes this a GREAT choice for an Eclipse shop. When I moved over to a Chromebook a few years ago I was sifting through all the cloud IDE options and Codenvy really stuck out as the best option from the start. Through the years they have kept to their word and keep making the service better and better. The latest version is just a complete "wow!" from seeing how much the platform has grown. Yes, it's practically a platform since it has so many great features baked in besides being a higly performant IDE; Git (GitHub / Bitbucket), Docker, Bower, Google App Engine (GAE), multiple languages, starter templates, "local" datasources, etc.! The portability of it makes it a simple choice as well since there's nothing to install and works great on every platform I've needed access to my projects (Windows, Mac OSX, ChromeOS, Linux).Portability to be able to access projects on any OS with nothing to install. Just open up a browser tab and start coding. The flexibility to write virtually anything from native Android apps to web apps that run on most PaaS. The ease of the wizard to start a new project is unmatched. Codenvy offers packages for download, managed hosting and cloud. Pricing is on a per-user basis and depends on the scale of the installation. Develop with any language for any platform. Guarantee consistency across developers and machines. Create a private Codenvy cloud behind your firewall. Powerful editor with intellisense and refactoring. Use your desktop IDE over SSH with portable workspaces. Complete customizability of environment, IDE and workflow. Docker machines to run any environment for build or debug. Recipes let you define any environment & provision replicas. Administer restrictions to code, keys, plug-ins & resources. 39% increase in coding time for development teams. >3x more code commits per developer, per week. Smoother more efficient feedback cycles. Developer on-boarding times of under 30 seconds. Below are some frequently asked questions for Codenvy. Q. What type of pricing plans does Codenvy offer? Q. Who are the typical users of Codenvy? Q. What languages does Codenvy support? Q. Does Codenvy support mobile devices? Q. Does Codenvy offer an API? Yes, Codenvy has an API available for use. Q. What other apps does Codenvy integrate with? Q. What level of support does Codenvy offer?